Who doesn’t love a savory, home-cooked meal at the end of the day? Our easy instant pot beef stew is a recipe that is sure to remind you of home. 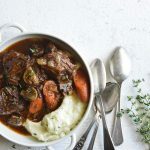 With notes of red wine, garlic, and Italian herbs, this easy beef stew recipe will have you drooling over your plate! Add the remaining 2 tablespoons ghee, onion, carrot, parsnip, and mushrooms. Cook briefly until the vegetables take on a little color, about 2 minutes, stirring frequently. Add the garlic and cook 30 seconds more, stirring constantly. Stir in the red wine and cook 1 minute, scraping up any brown bits from the bottom of the pot. Press “Cancel” to stop sautéing. Add the beef back to the pot along with the water, tomato paste, beef gelatin, Italian herb seasoning, salt, and black pepper. Turn the pot on Manual, High Pressure for 35 minutes and then let the pressure naturally release for 10 minutes before doing a quick release. Serve garnished with fresh thyme on top of cauliflower mash.